Aulonocara baenschi is found near "Nkhomo Reef", about 5 km before the coast of Benga. You can find them there living near spread boulders on the sandbottom at a maximum deapth of about 18 meter. 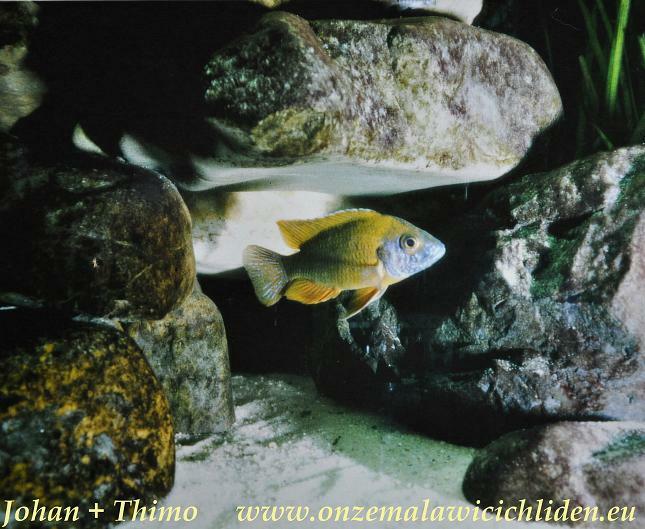 It's a very quiet cichlid which should be kept with other quiet cichlids, preferably not with other Aulonocara types because they intersect with eachother. They have had offspring multiple times, exactly beneath the rock on the picture. The male made a small hole in the sand - more like cleaning the surface of the sand - in which he seduced a female and after turning around eachother a lot of times the female disposed her eggs. In the lake the males of these species can grow to 10 cm, in the aquarium however they can grow taller because of a good feeding. The males can then grow to about 14 cm, females grow to about 14 cm. On the picture you see here is a young male which I had in my aquarium. Unfortunately, this is the only picture I have of the examples which I have hold in my aquarium.